This mantra of Lord Vishnu is recited for the attainment of material prosperity and liberation. The word itself means the Great Omnipresent. He is reclining on Ananta on the Milky Ocean. Ananta or the snake stands for cosmic energy. The ocean of milk stands for Ananda or beatitude. Vishnu's colour is blue like the sky, indicating his infinitude. He is Achyuta, because there is no rise or fall for him. The four-faced Brahma rising from his navel is symbolic of his creative power. Brahma has four heads because he is the creator of the entire universe. The Chakra or discus in one of the upper hands of Vishnu symbolises the cycle of time (Kala-chakra) whose whirlgig bringd in consolation as well as revenges, according to varaha Purana. it is also described as the Dharamachakra, maintaining orderlines and proper functioning of the Universe. The Shankra or conch in the other upper hand, according to the same Purana is the destroyer of Avidya, represented by darkness and silence. When Maha Vishnu touched Dhruva on his cheek with his conch he removed Dhruva's Avidya. Others say that Shankha represents Nada-brahma. 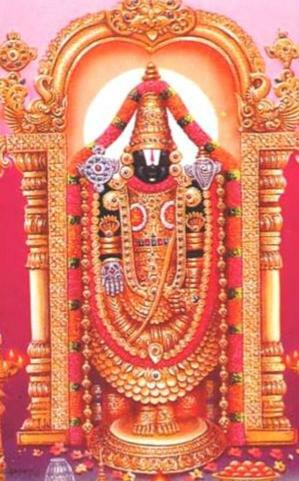 In one of his lower hands Vishnu holds the Asi(sword) or sometimes the club. The sword is meant to cut the knot of Samsara which man has woven round himself through numberless births. It is a weapon of detachment. If a club, it is for setting right the irregularities of the world, dushtanigraha and sishta paripalana. The lotus with the stem in the other hand of Vishnu, according to Varaha, represents Mother Earth eternally at work at her wheel of creation. Some would have it as representing the beauty and freshness in the cosmos. Mahavishnu as Ranganathan or Lord of the stages, describes his real function, as the Master of this Universe. The avataras of Maha-Vishnu-Matsya, Kurma, Varaha, etc.-are considered to be allegorical representations of the stages of human evolution, reaching prefection in the human or Rama-avatara. Krishna stands for one's conscience. Buddha is a emphasis on Ethics, Love and Service by which man becomes God. The Kalki-avatar is the personification of the Law of Nature by which manifest universe turns into the unmanifest.